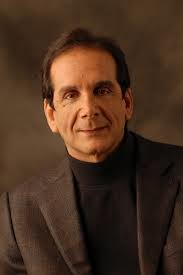 Charles Krauthammer offers his take on President Obama and the terrorist army ISIS in his column at National Review. With the support of U.S. air strikes, Iraqi and Kurdish forces have retaken the Mosul dam. Previous strikes had relieved the siege of Mount Sinjar and helped the Kurds retake two strategic towns that had opened the road to a possible Islamic State assault on Irbil, the capital of Kurdistan. In following through, Obama demonstrated three things: the effectiveness of even limited U.S. power, the vulnerability of the Islamic State, and, crucially, his own seriousness, however tentative. The last of these is the most important. Obama had said that there was no American military solution to the conflict. This may be true, but there is a local military solution. And that solution requires U.S. air support. ... These are the worst people on earth. They openly, proudly crucify enemies, enslave women, and murder men en masse. These are not the usual bad guys out for land, plunder, or power. These are primitive cultists who celebrate slaughter, glory in bloodlust, and slit the throats of innocents as a kind of sacrament.